Immortalise a Friend or Loved One with a symbolic gift that's truly out of this World! Your recipient will receive our fantastic gift set (as illustrated below), and your chosen star name will be registered and copyrighted in "A Personal Guide to the Universe" - a listing off all new star names and their telescopic co-ordinates. 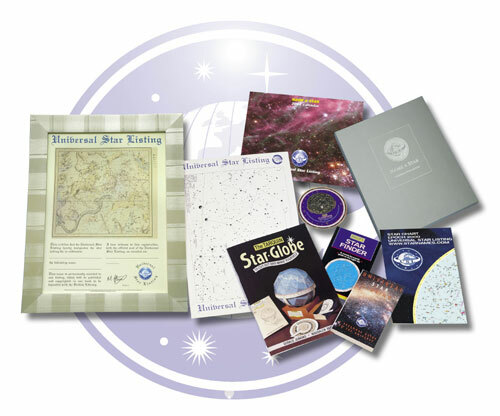 The standard Gift set contains an A3 size Certificate of Registration, an A3 size Star Chart showing the precise location of the star; a full-colour USL Wall Map of all the constellations; plus a copy of A Personal Guide to the Universe, a 250 page layman's guide to astronomy and mythology. Framed Gift Set - �69 - As per description above but framed in an antique silver frame. Name a star after a special person! An ideal gift for christenings, birthdays, anniversaries, thank you's, valentine's and all other gift-giving occasions. All we need is the Name of your star - this can be a real name, nickname, phrase or anything of your choice up to 25 characters (inc. spaces and punctuation); A date of registration - this would normally be the birthday or christening date etc. can be forward or backdated by up to 6 months from your order date and the Constellation of your choice from the list (leave blank if you wish for us too choose). Naming a star is symbolic rather than scientific. Nevertheless, this novelty gift is produced using real technical data and the USL star charts show precise star locations to Epoch J2000.0. The name you choose is associated with a real catalogue star number. Consequently, the USL computer system does not allow a star to be named more than once in the Universal Star Listing Register. Registration information is thus recorded, maintained, archived and subsequently published and lodged with the legal deposit libraries approximately every 18 months.